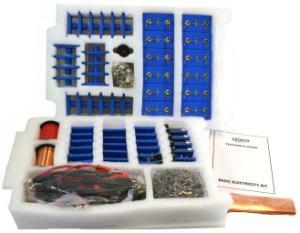 Comprehensive Basic Electricity Kit For Building and Studying Circuits. The basic electricity kit provides all of the necessary pieces to build simple circuits and is a much more user-friendly approach than the traditional circuit board. This kit provides sturdy tools with which to study the basic concepts of electricity and circuits in a visually and kinesthetically effective manner. The kit is also ideal because it can be easily and safely store using the polystyrene storage trays and sturdy plastic tub included. Container color may vary. Ordering information: Includes 12 cell holders (without batteries), 4 electrode holders, 12 10cm black leads, 12 10cm red leads, 4 25cm black leads, 4 25cm red leads, 8 crocodile clips, 4 changeover switches,12 carbon rods, 50g wire bare, 4 universal clips, 1 teacher book, 8 soft iron rods, 4 fixed resistors, 4 rheostat units, 1 sheet copper foil, 40 bulbs, copper wire bare, insulated copper wire, polystyrene storage trays (2), 20 bulb holders, 4 silicon diodes, 8 push switches, and 1 pack steel wool.